As Mercury opposes Saturn today, you may need to think about your own limitations, and how you’ve contributed to the obstacles that stand between you and your goals. The Eight of Swords speaks of self-imposed limitations. You may feel powerless in your current circumstances and may be so caught up in blaming the people or events that have brought you to this that you’re unable to see a way out. 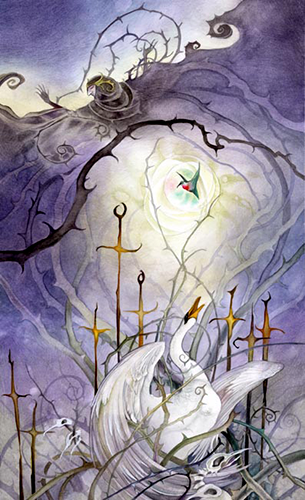 In this version of the card — from the gorgeous Shadowscapes Tarot — we see a graceful swan rendered almost entirely immobile by a the thorny branches of a blackberry bush. Eight Swords are placed strategically around her, amongst the decaying carcasses of earlier captives. She longs to break free, but her struggles against the confines of her “cage” cause her to get even more tangled in the bush. A tiny hummingbird flits above her taunting her with its agility. But look closely at the hummingbird and you can see that it’s not taunting at all. It’s actually showing the swan the way out. It flutters its tiny wings and coaxes her toward the light. If it can just get the swan to stop panicking and calm down, it can navigate its way through the brambles and disentangle her from the brush. 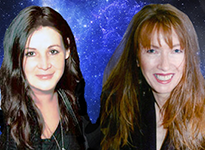 The Mercury / Saturn opposition can be a tough one. It tends to make things seem much worse than they are. Saturn represents limitations and restrictions, and its opposition to the planet that rules thoughts and ideas (Mercury) can make your situation seem more bleak. But as always with the Eight of Swords there is a way out. It may require a bit of ingenuity — much like is seen in this card. But it mainly involves simply opening your eyes, changing your perspective and finding a workable solution. The card used for today’s tarotscope — Eight of Swords — is part of the Shadowscapes Tarot series by Stephanie Pui-Mun Law and Barbara Moore. This deck can be purchased directly from the Shadowscapes website or through its publisher, Llewellyn. This deck can also be downloaded as an app for Android, Ipad and Iphone devices through the Fools Dog website. Please also “like” this deck’s Facebook Fan Page!